* NOTE: The route consultation form was not designed for our area and doesn’t make sense in the context of our location. We suggest you write a letter (or email), drawing on our templates where appropriate and adding your own content. Then send to HS2 as detailed below. You can also view a copy of our HS2 Update (PDF) presentation and download our consultation template response support documents to assist you in compiling your responses. Our template responses make it easy for everyone to get involved but it is, however, important to personalise your response to make it individual – this carries far more weight when evaluated. The consultations close on 9 March 2017. Email responses can be submitted until 23:45pm on the final day of the consultation. Paper responses must be posted on or before the final day of the consultation. Please only use the channels listed below when responding to the consultations. 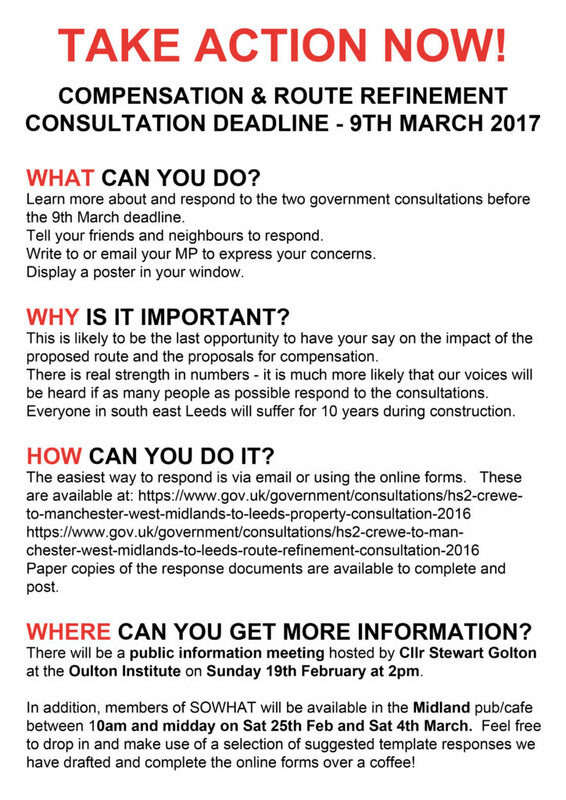 HS2 do not guarantee that responses sent to any other addresses will be included in the consultations. 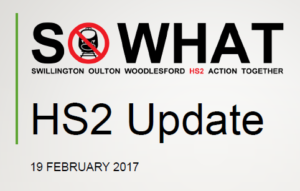 This entry was posted in compensation, hs2, Route on February 19, 2017 by Latest News. Click on the images to enlarge. 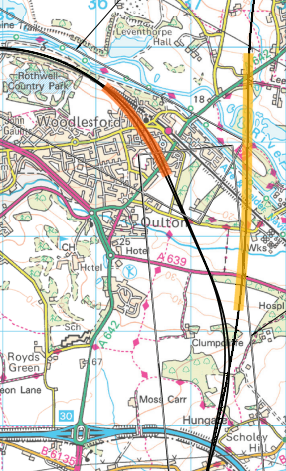 Although it’s not strictly to scale the illustration above gives a good idea of the impact on Woodlesford. The tunnel mouth cutting is around 140m wide (because there are in fact TWO tunnels, one for each track), and the track depth below ground level is about 15m. The viaduct height can be seen on the profile below which is to scale. The red house is just over 7m high, the size of a typical UK house. The viaduct is four times that height at Swillington Organic Farm! This entry was posted in hs2, Route, sowhat, Uncategorized on February 12, 2017 by Latest News. Print a poster for your home or car window to help spread the word.. This entry was posted in compensation, hs2, Route on February 11, 2017 by Latest News. Having tried to work with local labour councillors and Leeds City Council to secure a better future for Woodlesford and Leeds residents we have finally come to realise that they have no intention of doing so. And worse, they have deceived us and lied to us. Despite the Chamber of Commerce and Civic Trust supporting the views of Leeds residents and businesses in representations to HS2 and LCC, the council continue to work their own agenda, fuelling a vanity project on the south bank at our expense. Everyone is of the opinion that an integrated station, with a through route to the north, would be far more beneficial to travellers and the city. LCC on the other hand would rather have a disconnected terminus on the south bank. This entry was posted in Route on October 25, 2015 by Latest News.